I have to admit here that I have seen or been involved with many different incarnations of this classic tale, but never before have I seen it turned into panto. The person or persons responsible for this adaptation have not been credited, but sadly for me, and indeed many in this afternoon's audience, it was a half-way house and our young charges - the target audience - didn't really 'get it' until the much better and slicker second act. This has nothing at all to do with the sterling acting ability of the cast. 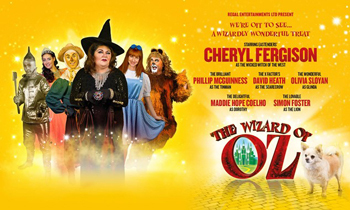 In fact Cheryl Ferguson as the evil witch Eva was superb, relishing her role and commanding the stage on her every entrance. Whilst David Heath, Philip Shaun McGuinness and Simon Foster made a great team as Scarecrow, Tin Man and Lion. I enjoyed Heath's physicality and Foster's amiable and easy stage presence, and they worked together wonderfully. [ a personal preference I know , but the Tin Man's robotic-style voice and body-language didn't work for me ]. Maddie Hope Coelho was a capable Dorothy with a sweet singing voice, and completing the cast was Olivia Sloyan as Glinda (the good fairy who speaks in rhyme), and Richard Hazlewood as The Wizard. (amongst other things). The problem lies with the writing, directing and concept. To start the show we were presented with a character with whom the audience were unfamiliar [and even by the end of the show we didn't understand his role or purpose] standing on stage alone dressed a little like a Robin Hood character, singing a slow and rather melancholy solo song from Charlie And The Chocolate Factory. No wonder your target audience didn't really respond or engage until much later on when it suddenly occurred to the adapter that they were in the wrong genre. The other issue I had with this show is that it relied far too much on technical gubbins which didn't really hit the spot. An extremely long and totally unnecessary film projection sequence for the tornado at the beginning, and a filmed denouement. - Why? This is live theatre and the tornado sequence was simply too long and boring. Further, I abhor the use of playback. Once again, this is live theatre and so a live band should be a pre-requisite - especially for a professional production of this calibre. And finally, why did the scarecrow not have a mic for his first entrance and then have to be given a clunky hand-held device half-way through the scene? All in all it was a somewhat mediocre production lacking pace and pazzazz, which once it finally managed to get going, did engage the youngsters who enjoyed themselves; it just took far too long to get there! It was also a little over-long for a panto, running at over two hours (including interval). I have seen much better pantos, but I have seen much worse too. Before I finish though, this panto, as indeed most pantos do, employed local children from local dance schools to make up the young ensemble. Two 'teams' of dancers are credited in the programme but it doesn't say from where these children are from. Moreover, why were they always pushed right to the back of the stage and left to their own devices? There were some very young ones in that line up indeed, and yet no-one thought to bring them to the front and let them have their moment in the spotlight. Two completely missed opportunities for advertising and garnering more audience.